Nicholas Heiner from the Netherlands has risen to the top of the Finn rankings after the third day at the World Cup Series in Hyeres, France. France’s Fabian Pic also moved up, to second, while Great Britain’s Ben Cornish didn’t have the best day, and dropped to third. 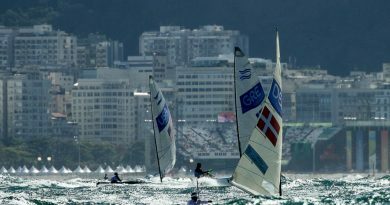 Race wins went to Brazil’s Jorge Zarif and Norway’s Anders Pedersen. 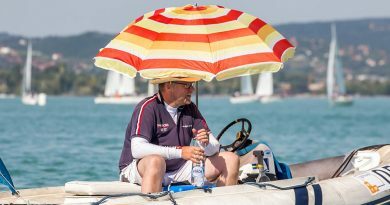 The Mediterranean resort remained grey and occasionally inclement as the regatta entered its third day. Predictions of mistrals remained a mystery while the Finn fleet got in two more races in a shifty offshore wind, which rose from 3-4 knots to top out at 14-16 knots. Pedersen was the star of the day, leading round the first windward mark in both races, and, but for a first race, second beat, error, could have won both races. Two attempts were made to start Race 5 in a very light wind, but on the third attempt the wind suddenly filled in at 12-14 knots. However the windward marks were not reset, so the first leg was very short, resulting in a very congested top mark and first gate rounding. Pedersen led round from Zarif and Croatia’s Josip Olujic. Pedersen held his lead at the gate but on the second, and much extended, upwind, Zarif emerged ahead to lead down to the finish for his second win of the week. Heiner crossed second after passing Olujic on the final downwind. Race 6 was similar with the fleet quickly getting over to the right side of the course. Again it was Pedersen leading round the top, but this time he sailed well and extended for the win. Ed Wright from Great Britain was second throughout much of the race, holding off a strong challenge from Piotr Kula, from Poland, who crossed in third. Pedersen, the 2014 Junior World Champion, won the day with a 4,1 to move up to seventh overall. Kula ended up with a 7,3, to remain in fifth overall. However it wasn’t all smooth sailing. After the disappointment of not qualifying for the Rio Olympics, Kula weighed his options carefully. But he decided to come back and is full of optimism and joy for his third Olympic campaign. Kaynar ended the day with a pair of sixth places. The Finns continue with two more races scheduled for Friday from 13.30. 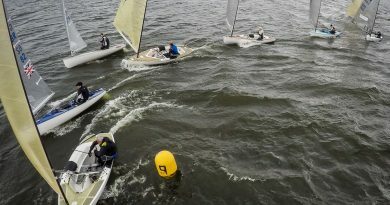 Racing continues until the medal race on Sunday 30 April.